Bit happens! New Bit Figs on Sunday at 9:00 PM Eastern. Jumbo Pheyden painted, plus Pheyden Blue ninjas, kitties, ducks, and the rest. Click here to read more at Onell Design, and click here for the Culture Pirates shop where they'll be sold. I got the gold one, and I was quite pleased with it. They're here! They're new! 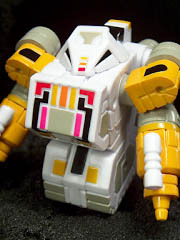 The ToyFinity Store has a simply gorgeous update with the pretty fantastic Robo Force Sentinel the Protector along with Mystery Mordles, a Neo Zeroid, a blank Robo Force kit, a Darkness Soldier, and some other goodies. Click here to see what's left. The good/bad/great thing about Robo Force is just how much meat are on those bones - each kit includes a ton of parts for building, reconfiguring, and customizing. They're also not the cheapest - but there's a lot of plastic in a bag. Check 'em out. The gap between the first and second The Outer Space Men Onell Design specials was five years. Five years. Thankfully Alpha 7 Zekroyas was only 3 months after the last one, bringing the man from the red planet back as a figure that's not only red, but has a unique color layout. It's not just a color-swap, but there are significant changes to where you'll find paint this time around. If you've been collecting this line for a while you may have six (or seven, if you dig variants) and more or less know what to expect. This is the first wholly original painted version to see release in quite some time, as the original Alpha 7 [FOTD #388] was based on a toy from the 1960s, and Alpha 11 [FOTD #744] was inspired of a contemporary - and ultimately unreleased - redeco. 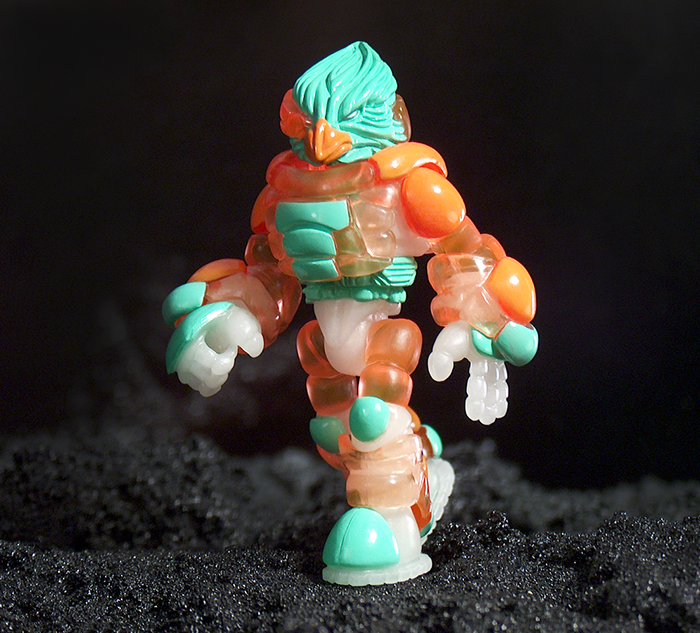 The Zekroyas version from Onell Design is a match for the Crayboth and Quallerran figures released at the same time, so they're siblings in a way. I'm super keen on figures painted like the Outer Space Men so I picked those up, too. When I saw the first Bit Figs showing up on social media, I thought "Those are neat, but I'm sticking to this whole 'don't buy made-on-demand' kick." I already live in sort of a black hole of toy purchases. When I saw a plastic made-in-a-factory Mega Bit Pheyden Trophy Set was on sale - $10 for 2 figures, no less - I pounced. 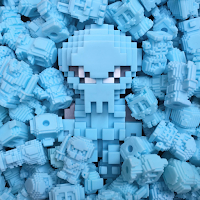 I love weird pixel things, and I love Glyos, so it's a good mix. (So far I've skipped Minecraft because boy howdy those things are pricey.) With a 2 3/4-inch and a 1-inch figure, made of 4 total chunks of plastic, I figured I should give these a whirl. When the announcement of new glowing "Cosmic Radiation" figures came up, I commented that these would be in addition to three existing glowing figures. I was told that the first Gamma-X [FOTD #939] didn't glow, but it does - just not very well. Regardless of the confusion, it's telling because it proves that Cosmic Radiation Edition Gamma-X 100% needed to exist. The original 2014 figure was a top-notch update of the original Colorforms prototype, matching the color and everything. It just didn't match the original action feature - that is, to glow in the dark. If you've bought both figures, you've got one that looks right and one that looks right, and this new 2016 convention exclusive is actually $1 cheaper than its dim-glowing counterpart. I'm not saying it's 100% better, but it's different enough that I think you've got reason to potentially buy both if you're so inclined. 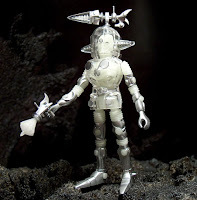 In case you didn't get yours, the Outer Space Men Shop has just added the Star Trek Mission New York Exclusive Cosmic Radiation Gamma-X figure. $25.00, and Colossus Rex 2.0 is still available if you want to save on shipping. A full review of this figure will go live next week, so come back for that. And then you'll probably never hear about this one here again. Quest of the Quallerran! The new Noboto head makes its debut alongside an Outer Space Men crossover, lots of glowing plastic, and oh so many Pheydens. The Andromeda one glows, has clear armor, and also sports five unique heads. Eclipse and Frontier Pheydens get their long-awaited MK II releases, plus there are new joints, Crayboth, and other goodies to delight you if you got them and anger you if you missed it. Click here to see the September 7 2016 Onell Design drop menu. Onell Design have been posting previews all day, and the next drop is in about 40 minutes. I could just wait to post the menu, but why? Enjoy the previews, and be back at 9:30 PM Eastern to see what else they have on tap for the glowiest, Halloweeniest drop of the year. Images stolen procured from the Onell Design blog which you should read right now. Maybe they have more! Since taking a nap in 2014, it seemed that the Outer Space Men toy line was done. Well, it seems that with Colossus Rex 2.0 the manufacturing duties are being handled by the licensors, rather than the Four Horsemen, although the original packaging templates and figure toolings are brought back to make a similar-but-different release. If you bought the 2014 original, good on you - it got expensive on eBay and Amazon if and when one showed up for sale. Based on some rough numbers at least 1,000 are estimated to exist of the original, and most fans ultimately just wanted the painted ones - so thankfully Gary Schaeffer brought this one back with a bluish deco variant. If you just want a painted Colossus Rex, either version of this 5-inch-and-change titan should be just fine for your shelves. Reviews start next week - but these are new @bitfigs from Culture Pirates, SSM Vending, Onell Design, and presumably someone else. I don’t know who. The idea is that they’re (mostly) vending machine figures, so keep an eye open for these in other colors. The top row shows animals, the bottom row shows ninjas. Each one has a hole in the feet which is the size of a Glyos peg - good for staffs, alternate heads. Each figure is about 1-inch tall and is unarticulated. On the left are two (so far) online exclusive Bit Figs. 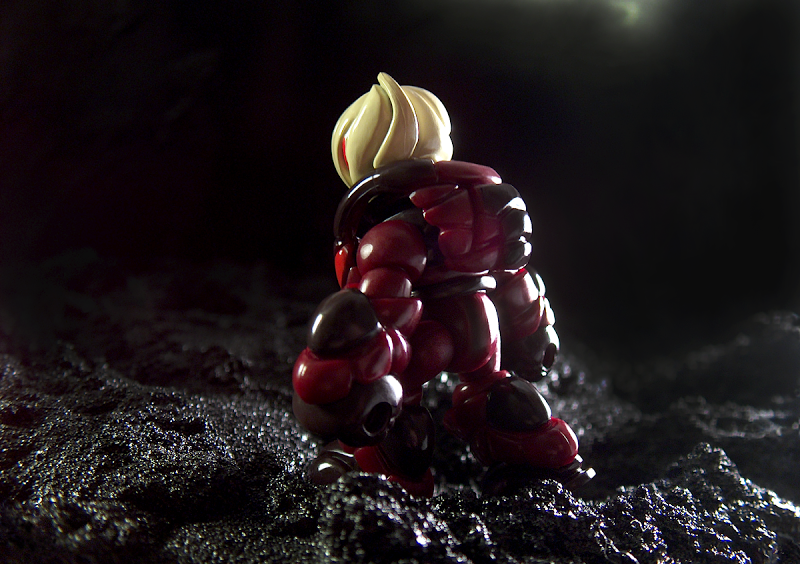 The big one is a large Pheyden with articulated arms that are removable and swappable with other @glyos pieces. The little one is a little one. Interestingly, the animals and ninjas are marked “GLYOS BIT FIGS″ - the only Glyos-family figures so far that I can recall that have any sort of markings - but Pheyden doesn’t. He’s just this guy, you know? Also confusing, today in Japan they announced Transformers Bit Figs and they’re something else entirely. So far, I’ve counted (but have not personally seen and do not yet own) 62 different tiny Bit Figs from a grand total of 11 molds, plus the big one. I’m contemplating a checklist thing. I’ll be sorry if I do this, I just know it. The only “wild” bit figs in vending machines have been 75 cents so far. The Culture Pirates ones are roughly a buck a pop when bought in a bag. I’ve already posted this review if Ninjas Ku in all 10 (known) vending colors if you’d like to see more. If you want vehicles to go with them, so far Hot Wheels has a Minecraft Mine Cart. (Review also coming at you next week.) I’ve seen - I swear I’m not kidding - 10 different package variants of it so far. Target is getting cases of solid Mine Carts with different artwork - but it’s the same cart, so far as I can tell. A basic blue-carded cart also exists, with at least 2 different bubble variants. (One slides back and forth, one does not.) Because I’m not insane, I just bought one, and it’s a dollar, and it’ll fit most Bit Figs in addition to the smaller Mattel Minecraft figures. If you’ve ever had the urge to send Pheyden or bunnies through Hot Wheels loops, now’s your chance. A late update - most of them also fit nicely in the Tankinator car. 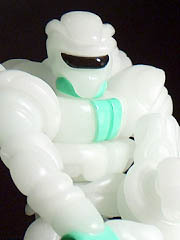 Speaking of glowing figures, Onell Design has AASC GITD on tap for Wednesday at 9:30 PM Eastern. That's "Axis Armored Spectre Commandos" in glow in the dark plastic, and while no specific drop menu has been given there are expectations of at least one new head - and possibly other surprises - in the water. The Star Trek Mission New York exclusive Cosmic Radiation Gamma-X will go on sale at 9:00 PM Eastern on Friday, September 9. It's $25.00 at the show right now, and presumably on TheOuterSpaceMen.com as well. It's a lot brighter than the original figure - as you can see, the one on the left (2014) was exposed to the same black light as the one on the right (2016). 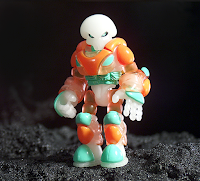 Being cast in glow plastic makes all the difference, so if you're one of those people who specializes in glow Glyos you might want to set a timer for this one. Because of things like shipping, sometimes I drag my feet. We don't have any Hastings stores in Phoenix, so I didn't pick up the Knights of the Slice Integer Knight - my first of this line - until Comic-Con this year in San Diego. This was an exclusive to the We Love Fine booth, but you wouldn't know it to look at the booth - I just happened to be checking Tumblr before I went to work at the show, saw the post, and ran to go buy one right after. (I'm not exaggerating.) I'm glad I did - it's a wonderful figure! I'm now upset I didn't get the fully painted ones. It's not that this pink figure with blue armor is bad - far from it! - I just see how much better the decorated ones are now. I can definitely say this is one of those times I regret not having jumped on the Kickstarter a couple of years ago.